FAIRBURN, GEORGIA – The Pennie Tour visited The Georgia Renaissance Festival during pirate weekend on May 22nd, 2011. The Georgia Renaissance Festival recreates a fun and inviting 16th century European faire. The Fairburn, Georgia location offers 10 stages of music and comedy shows, a cast of nearly 1,000 costumed characters, all against a permanent backdrop of Tudor homes and cottages. Come early to take in all that the faire has to offer. Shopping at the artists market is like being in a real European faire. Our favorites include Heirloom Jewelers and the many bath and candle shops. Over 150 master artisans demonstrate daily the art of weaving, spinning, glass blowing, sculpting, and leather crafting just to name a few. Shopping of course, works up an appetite. Of course there are turkey legs, but the food at the Renaissance Festival is not your ordinary faire food. One can indulge on Steak on a Stake, Pork Loin on a Stick, The King;s Weinie, and our favorite – fryed pickles. Followed by fabulous desserts such as chocolate covered strawberries, apple dumpling Sunday, or peach cobbler for those Georgia Peach lovers. The Festival offers hundreds of items to choose from! Staying hydrated is very important when exploring the European village. Mead, ale, domestic and imported beer and wine seemed to be the adult drinks of choice, with many sporting their own souvenier half-yards and mugs. The highlight of the faire was The Joust – where knights in shining armour, guide their steeds and joust with authentic weapons. This event gets the crowds cheering and waving colorful pennants all rooting for their favorite knight! Other shows include the unconventional Hey Nunnie! Nunnie!, The Mud Show, the hilarious Tortuga Twins (offering G and Mature Adults Only show versions – choose wisely), The Ded Bob Sho and many others to enjoy! 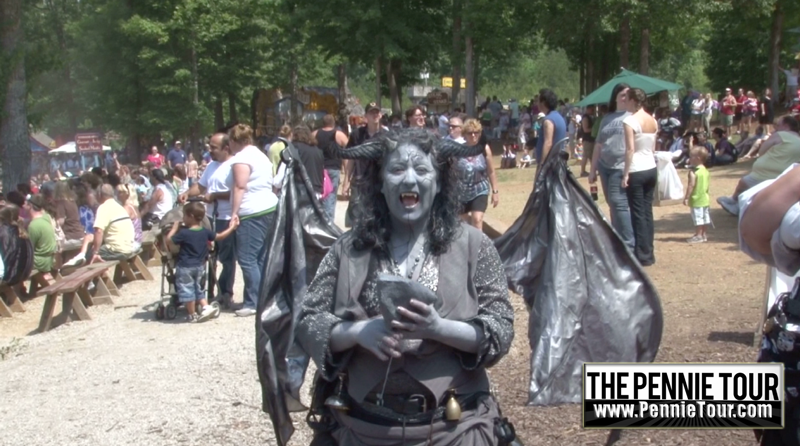 The Renaissance festival offers many different themed weekends. Pennie Tour enjoyed Pirate’s Weekend……what do you a call a group of Pirates? A parcel of pirates? A pack of pirates? A crew of pirates? Whatever the case, Pennie Tour enjoyed Pirates, shows, food, shopping, sipping, playtrons, pub sing – we had so much fun experiencing all the many aspects that the Georgia Renaissance Festival had to offer!